Most regular readers (like, two out of the three) know that I met my bride while selling western boots one summer at Wall Drug. You might not know that I actually worked three summers at Wall Drug in an effort to be near my bride, and that each summer, I bought a new pair of boots. Up until a few moments ago I was convinced that I had written at length on this site about my once-and-future obsession with boots. Apparently not. I know I wrote about it in a newspaper column at one time; I’ll try to round that up and post it shortly. In the meantime, suffice it to say there was a time when I knew more than was healthy for a boy my age about boots and boot makers, leathers and stitching, fit and finish. I could convey that knowledge to cowboys, bikers, and foreign tourists, using only my hands if I had to, and I lived in boots, at least in the summer months. 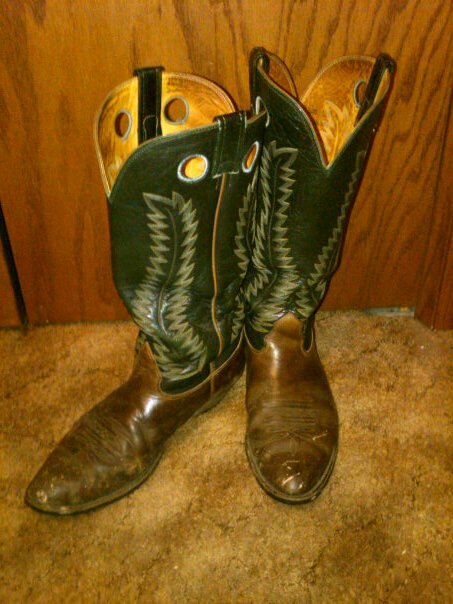 My three pairs of boots are pictured below. In my Second Third, I intend to wear the soles off them again and again. Why? Pfft. Just look at them! My first pair (also pictured at the top of this post). Summer 1994. Nocona size 12 1/2D (the perfect fit from day one). Chocolate oiled bull shoulder with black tops. Soft as moccasins; tough as nails. I’m on my third set of soles and heels. My second pair. Summer 1995. Blucher Boot Company, custom-made for someone else, but didn’t fit them; fit me like a second skin. Black French calf tops and bottoms. Soft and smooth and takes a nice polish. Great for dancin’ if they didn’t look so wicked. And if I danced. Still on the first set of soles and heels. My third pair. Summer 1996. 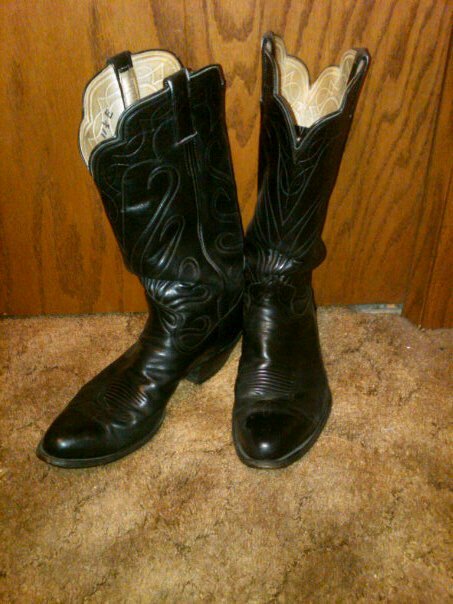 Nocona size 12 1/2D. I special-ordered these for rougher use: oiled cowhide foot; high green goatskin tops, and a bit higher and more underslung heel, just for kicks. I also put a black rubber half-sole on them for extra durability in the wet or on pavement. Scratched, gouged, salted, and paint-spattered. Second set of soles and heels. 1. Matty would fit in your boots. Both of you have humongous feet. 2. I want a pair like the first ones. 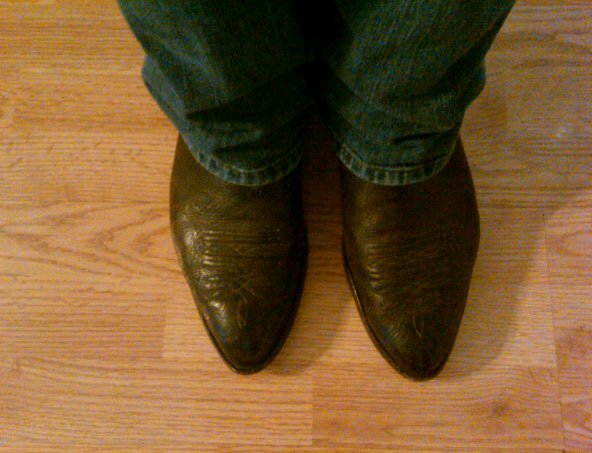 4.When I see “dress shoes” on a man, I can't help but scoff a little because EVERYONE KNOWS that when you dress up, you need to wear BLACK COWBOY BOOTS! My dad would do that for every wedding with a suit. 5. I want to go shopping for some boots now. Mamloco: I had a white tux for our wedding (Jodi insisted; I really wanted dark gray). Partway through the night, I changed my white pants and white shoes and wore Levis and the Bluchers. With the white shirt, tie, and tails. Classy. “Rats with boots on their tails”! That still cracks me up when i think of it! You really ought to tell these people that story! More than was healthy? How can that be?! I would venture that a healthy understanding of the power of boots was a requirement for being an interesting human. Four pairs. They don't look like yours but they are essential and well-worn. 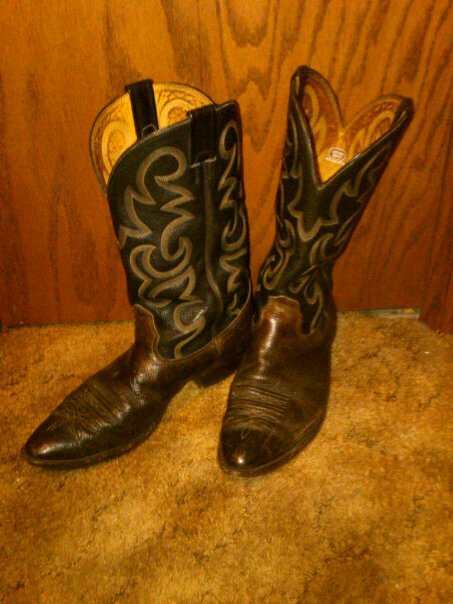 AND, I bought a new pair yesterday from a young boot guy who knew a lot, but who was – no joke – younger than the pair of boots I had on.